Back up of your system is very important and everyone wants to back up his/her data. If you haven’t back up your system back it up right now and save your information from losing. Most of the people don’t pay attention on back up and they suffer the data loss. On technically point of view, it is highly recommended to back up your all data. Don’t back up only at one place, make your backups more than one place, if you want to be at safer side. Backups are not difficult or painful thing nowadays. 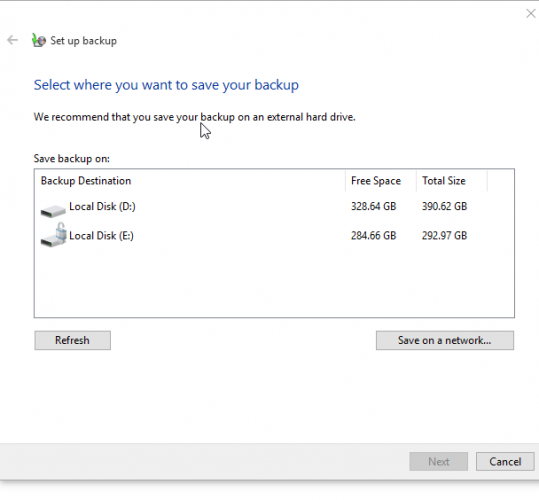 Backing up with windows 10 has become very easy and simple. Windows 10 is providing two most easy and reliable back up software by default. 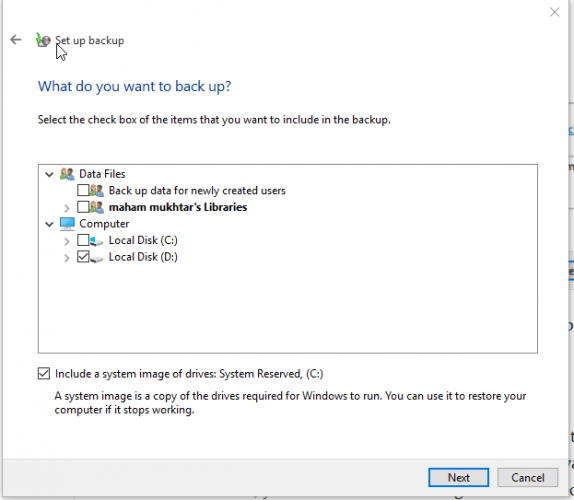 File History and Windows Backup and Restore. File History makes the backup files of every folder of your system in User folder. It makes versions of each back up file time to time. Whenever you made changes in your files, this will make new back up version of that file. This back up each folder on your system. Just follow the below steps to back up through “File History”. When you go to “more options”, they will ask you to click on “back up now”. There you’ll see more option too i.e. 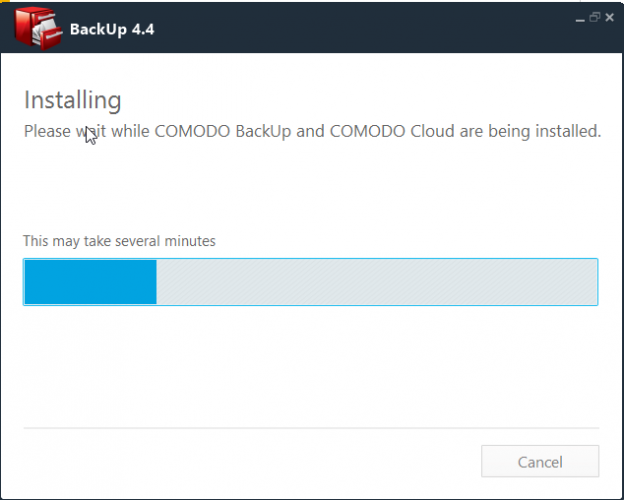 how much you want to remain that files as a backup(forever or up to some certain time period), when and at what time you need to back up files and which folder you need to back up. 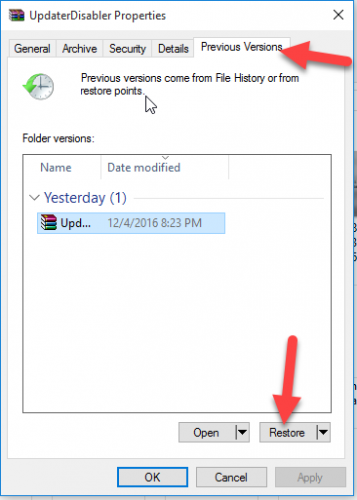 If required folder you want to back up is not in the list you may also add new folder (your required one) go back up that. It’s as simple as anyone can think. Just go to folder you want to backup files of and right click on it and go to the properties of that folder. There you’ll see the “previous version” option. Click on it and then you’ll find an option “restore”. Click on it and restore your desired folder. 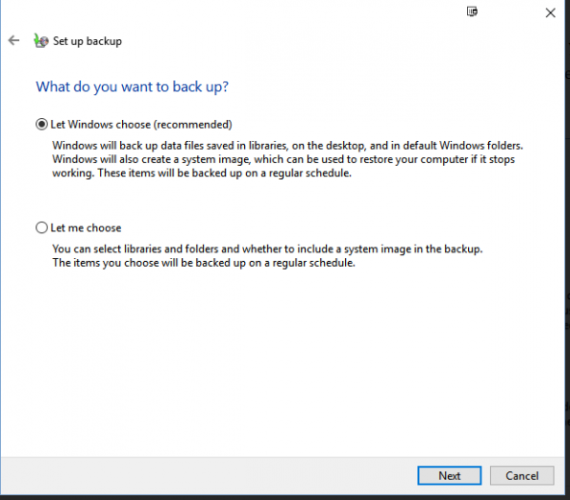 Backup and restore is also a legacy backup tool for Windows 7 which was also included in Windows 8.1 and Windows 10. It provides you one version of back up of all of your recent files and also creates a “system image” which is snapshot of your system. For this back up, you need to use different drive other than “File History” to be at safer side. 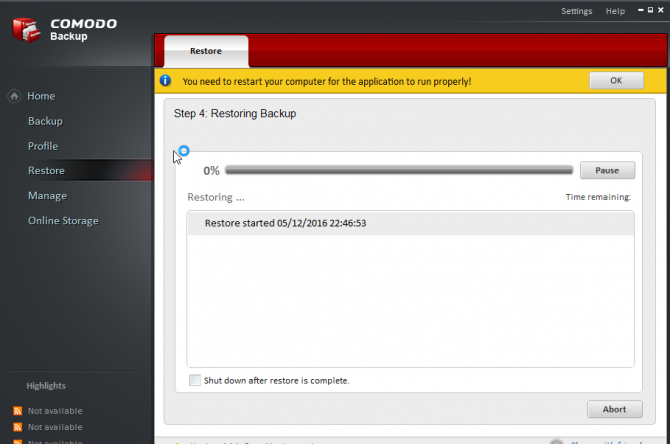 Follow below easy steps to back up your system through “Backup and Restore”. 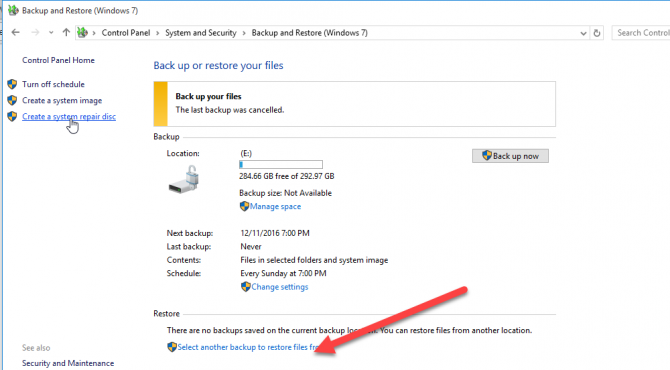 Search for “Backup and Restore” in start menu. And click on “set up back”, after opening “Backup and Restore”. And then it will ask, where you want to back up your files. 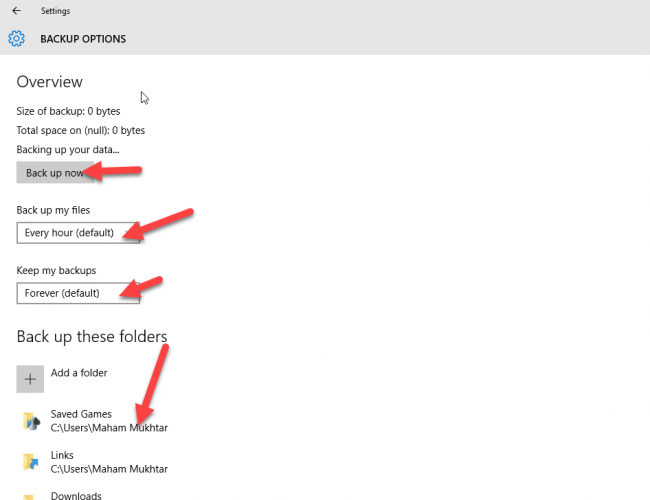 Then you’ll have to decide which folder you need to back up or allow window by self to choose it automatically. If you select on “let me choose”, it will give you option you want to back the files. If you once back up, again it’ll back upon same time and date automatically. If you need to restore the files, go to control panel open system and security and go to “Backup and Restore (windows 7)”. Then it gives you the option to restore the backup files. These are two back up methods of your system, these are simple and easier and built in windows. If you want more precise and advanced back up software then you may go for following other tools to back up your data. 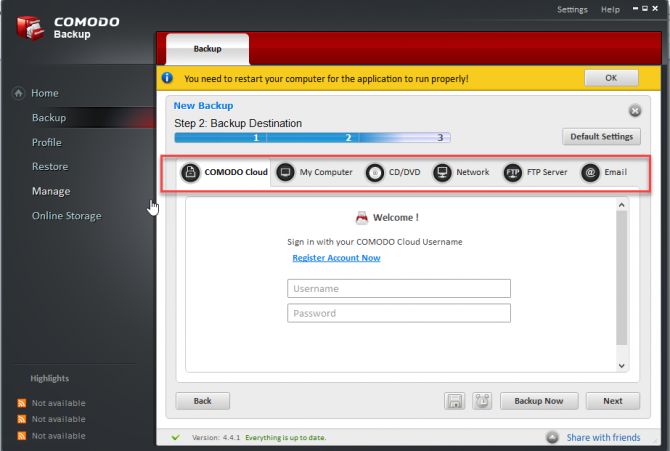 Comodo Backup is free back up software that is used by home purposes and official purpose. It is reliable, fast and advanced. It safely makes back up of your all files and data and provides you easy restore whenever you want your files back. It makes your data safe and users have no tension of losing their data/files. 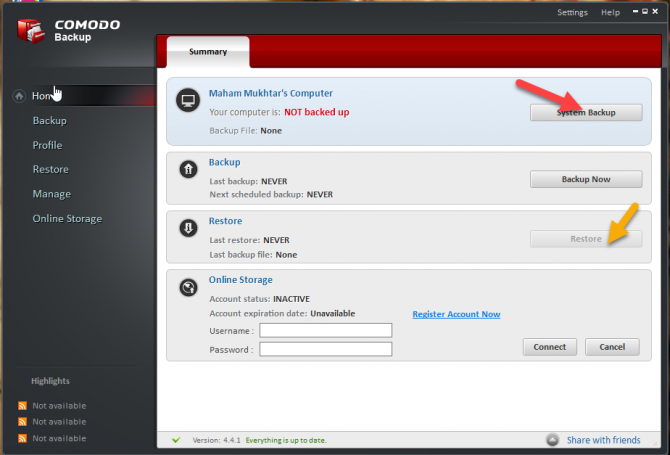 Download Comodo backup software here. Its executable will start downloading and run the program after download finish. 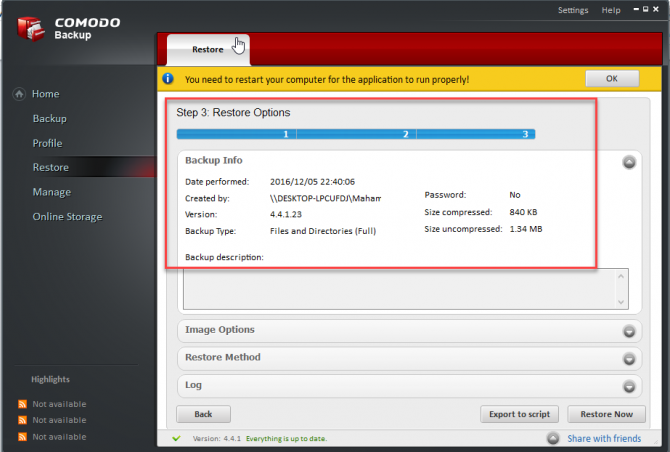 Comodo Backup provides a very simple interface of backing up and restoring your data. When you click on”backup now” it will provide you a screen that asks you which files you need to back up. After that it will ask you where you want to make back up of your files.it will provide you many option and then user can select which one is feasible for his/her to back up his/her files. When you press next, it will start backing up your files and complete it within few minutes or seconds. And for restore, click on “Restore” from home page then it will ask you which folder you want to restore. After selecting your files you want to restore, it will ask you the location where to restore it. In third step, it will show you restore option then after confirming options click on “restore now”. Then restore will start and complete in within few minutes. This is one tool for backing and restoring your data and files easily. This is providing you simple and easy interface. Now no one has fear of losing data. You can just back up your files only by few clicks. Cobian Backup 11 Gravity is the latest release from Cobian at the time of this writing. In this, task’s priority will be added. 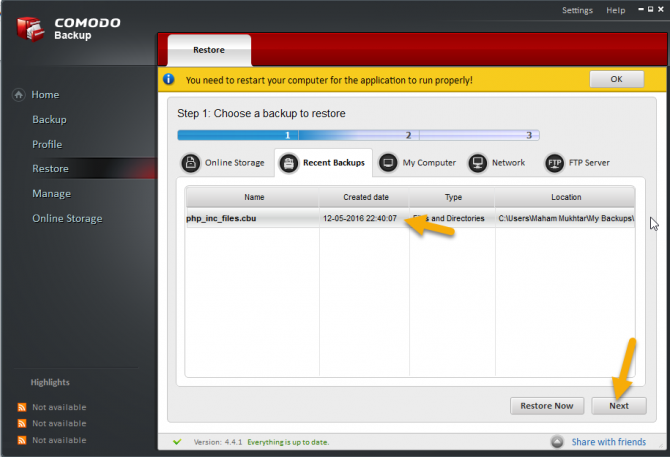 User can fix a day and time for backup the data. This software will delete old files automatically. Many different parameters are added in this version. It’s installer is improved than previous version. FileFort Backup is an easy backup software which directly saves your files according to their properties into relative backup location. For example documents to Google Drive, Music to Dropbox, photos to FTP server, personal data to local network etc, Its installing process is easy. you can backup manually or it can back up auto. provides you easy interface of software. It provides you a schedule for your backing up of data on your required date and day. It is reliable and safe data backup software. Viruses and malware are very common and can easily destroy your data so for this purpose back up is very important. 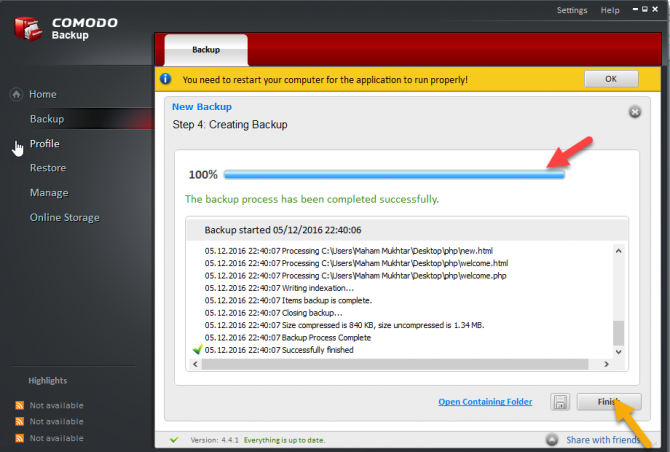 Backup Maker provides you a very safer backup of your files and data. it provides the encryption of up to 256-bit (AES) to your data so that your data will not use as a wrong purpose. It makes as much version as user want for his/her files. it is available in free and pro versions. It provides free local backup, free offsite backup and unlimited online backup. if you are working on your system and suddenly you have an emergency and you have to walk away. Now it is no matter. CrashPlan Backup will auto save your files when you walk away. it provides you access of your files anywhere. It is also available in free and Pro versions. Download CrashPlan Backup from here. So above all are backup software, You can choose anyone of them according to your need and which one you find best for your use. These all provides you easy and reliable data backup for your files. I hope this article will provide comprehension solution for what is the best way to back up your data. 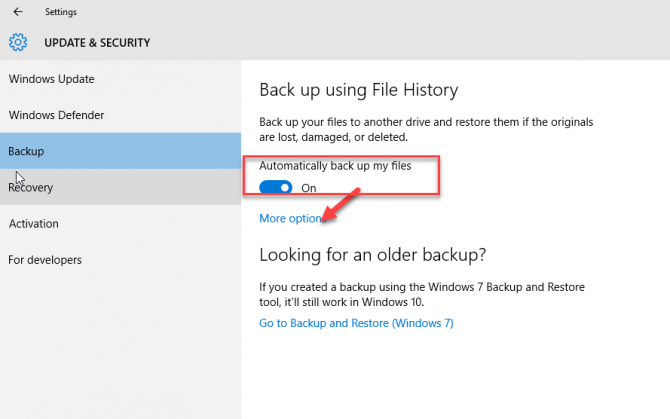 Which is your choice for backing up your data in Windows 10? I tend to like simple solutions, like Microsoft sync tool. Setup folder pairs to contribute, echo or syncronize to a server, NAS or attached storage. Then just select the folder pair to backup your data manually and your own time intervals. David you’re using a very good technique. For advanced users, it’s ok to use customized solutions but normal users prefer automated one click solutions that work for them. Personally I prefer SyncBack utility for synching my data over the network and in the cloud as well. Have you tried SyncBack?